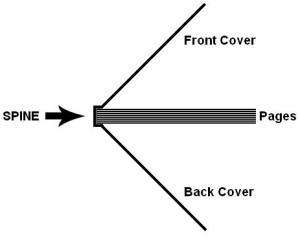 Book Printing Lingo: What is the Spine of a Book? The Spine of a book refers to the outside edge of the book where the pages are gathered and bound. In addition to providing an anchor point for the pages, the spine provides the hinge action that allows the book’s cover and pages to open and close. 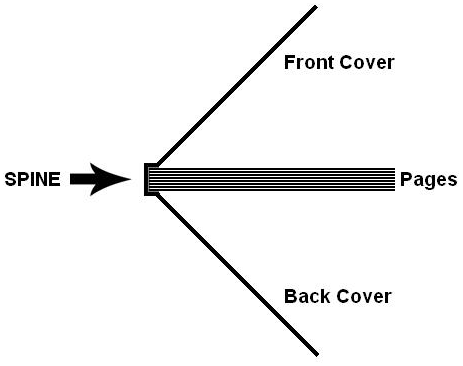 In most cases, the spines of hard cover books and perfect bound books are wide enough to be printed upon. However, the number of pages and the thickness of the pages is what determines the width of a book’s spine. The wider the spine, the more surface area it provides for printed information. Printing the title and other features on a book’s spine allows the book to be identified while it stands vertically on a shelf or lies horizontally in a stack. Some books are unable to have printing on the spine. For example, the spine of a saddle-stitched book is formed by creasing the book’s cover. Therefore, the spinal edge is quite narrow. As such, the spine of a saddle-stitched book is not wide enough to print on. The spine of a coil bound book consists of a plastic or metal spiral coil, so it too is unable to receive printing. Formax specializes in short to medium runs of soft-cover books. We offer digital and offset printing, with a variety of finishing and bindery options. If you have an upcoming project for perfect bound books, saddle-stitched books or spiral coil bound books, get in touch with us. In addition to low prices, we offer excellent advice too.